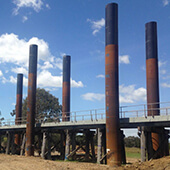 "Stronger bridges mean boosting the capacity of important freight corridors through Gippsland that are essential to supporting these local industries." "This project is about enabling safe and efficient freight movement to support Victoria’s growing $21 billion freight and logistics sector." "This section of the Princes Highway carries over 3,300 trucks each day and is a critical link for transporting goods in and out of Gippsland."